How to fix iOS 7 SSL/TLS security bug without upgrading to iOS 7.0.6? By now, everyone who owns iPhone might be aware of the SSL/TLS security bug in iOS 7. At the same time, you might also want to upgrade to iOS 7.0.6 which fixes the security hole in iOS 7. The exploit in iOS 7 will open your device for malicious attacks on public WiFi networks. Today my friend asked me whether he should go ahead and upgrade his device to keep himself protected against the attack? Well, it depends. For instance, the bug was available on your device for more than a year (since 2012) and it didn’t affect you and probably it may not in future as well. Do you still want to upgrade? Ok! May be not a convincing one, but what if you upgrade to iOS 7.0.6 and you need to re-jailbreak your device, install all those apps and tweaks again. Do you still want to upgrade to iOS 7.0.6? Any jailbreak user, would say no. But of course, you can’t leave the bug as it is thinking that it may not affect you at all right? Here’s a solution. If you own a jailbroken device, then you can use an app called “SSLPatch”, developed by Ryan Petrich. All you need to do is, just install the app and it will patch up the security exploit in iOS 7. Ryan’s SSLPatch comes as free in his repository. To add the repo, open Cydia application and tap Manage > Sources > Edit > Add > http://rpetri.ch/repo. I could test the app on my jailbroken iPhone 4S and it worked as advertised. Once the tweak is installed, reboot the device. 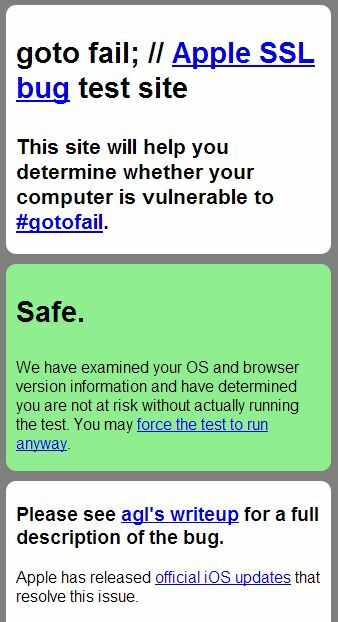 Later browse to gotofail.com, which is a web application to detect whether your phone is protected against the SSL bug. That’s it!